2. Mini-keyboard with 88 keys. 3. Built-in touchpad. Imitating mouse’s function on both touch-pad and 2 beneath buttons. 4. Ultra-stylish design with concise outline. 5. Plug and Play - No software to Install. 6. Quiet stroke and tactile feedback due to Membrane included. 7. Slim in Shape - due to “ X-Type” “ Scissor Type” key cap design. Work freely, without restrictions of space, angles or distance. This compact SlimTouch keyboard is perfect for tighter spaces, including the living room, kiosks/stations, conference rooms, mobile, and workgroup project environments. 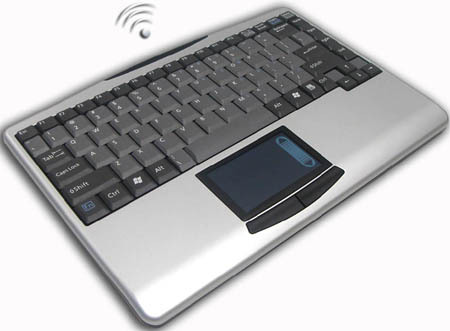 The Wireless Slim Touch Mini touchpad keyboard also features 2.4GHz RF connectivity, an ultra-slim, ultra-stylish design with clean lines, and an integrated touchpad - eliminating the need for a mouse. This unique keyboard fits beautifully with contemporary PC systems, flat LCD monitors and Tablet PC's in modern office environments. It’s small, compact size is also extremely mobile easily fitting in a briefcase or backpack. When on the road, the USB mini-receiver plugs directly into a notebook or another PC providing connectivity up to 100 feet away..
11.8" x 8.3" x 1"
We have been using this particular model wireless keyboard for many years and it is becoming difficult to source. ErgoDirect was very friendly and professional to deal with and were very helpful at expending the item. We will shop here again. Thanks.